Aberdeen scrap metal re-processor and steel trading firm, John Lawrie Group has taken delivery of a new £2.5 million metal cutting machine, known as a shear. Designed and built in Italy, it is the biggest of its kind in the UK. Having successfully completed an extensive commissioning programme, the shear, based at the company’s processing plant on Greenbank Road, Tullos, is now fully operational. Capable of breaking huge volumes of scrap metal into manageable chunks for re-processing, the new shear is particularly suited to handle large scale items from the offshore decommissioning market. Commenting, John Lawrie Environmental Director Ray Grant said: “Being the biggest of its kind in the UK and one of the biggest in Europe, our new shear provides a much needed local capability. It is ideally situated to service the offshore decommissioning market which is expected to accelerate as offshore installations come to the end of their useful life. The scrap items processed at the site will ultimately be recycled into new steel products. “This investment is particularly significant because it is the first of many new initiatives to come following a review of our environmental policy earlier this year. This policy forms a commitment from the group to maximise recovery from waste products in an environmentally acceptable and sustainable manner. 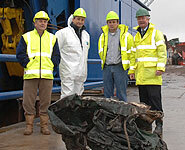 John Lawrie operates scrap metal processing facilities in Aberdeen, Montrose and Evanton. The firm achieved a £76million turnover last year, an increase of almost 40% on the previous year.